So I have this really neat trick where I pick out fabric for a sewing project, sometimes I even get as far as cutting it out, but then I get stuck. I think part of this is because when I sew, I want it to come out perfect, but I'm not patient enough to go that slow, so sometimes I never get past the cutting stage. I'm not really sure what's my deal, but in order to get over it, I'm going to show you some of my works in progress and then I'll (hopefully) finish them in the near future and show you the end results. There's this reusable grocery bag pattern from Butterick's "See & Sew" line. It's super easy. A front, a back, a pocket and some bias tape. I literally just need to sew this one up. 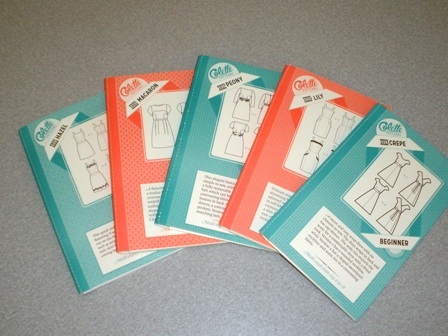 Then there's this scrub top pattern from Simplicity. 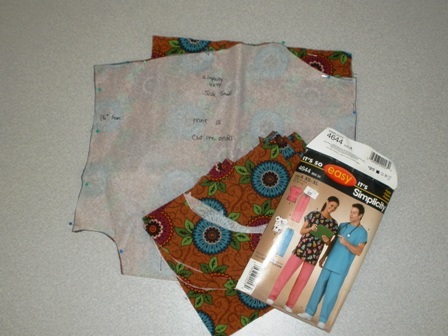 I work at a hospital and I've found plenty of cheap scrub tops on Ebay, but the truth is sometimes I would like to make them out of fabric I really do like. 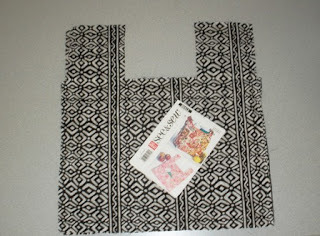 This is a unisex pattern and I noticed a lot of reviews of it stated that it is humongous. So I cut out a size small and I used some fabric that has been in my stash forever so if it turns out to be a flop, no harm done. I cut mine shorter so it will come to just below the waist and not down past my hips. I also eliminated the chest pocket and just left the two front bottom pockets. It's very easy: two pockets, a front, a back, a front neck facing, and a back neck facing. I love that the sleeves are set into body of the top, kind of like kimono sleeves. Simplicy 4644 in progress. Fabric is a rust color with turquoise and magenta flowers. Then there's this dress. It's from McCall's Fashion Star line. I never watched Fashion star, but I like that this dress had a fitted bodice and then a really loose skirt. It too is all cut out, just needs to be sew up. It has a belt that makes it have a kind of empire waistline. I really like the fabric I had picked out so I really hope I like the finished product (once I finish it). The fabric is a reprint of a William Morris wallpaper print. Hopefully it isn't too busy of a print when it's all done. 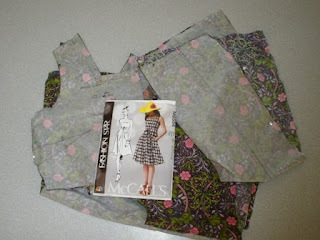 McCall's M6554 in progress with William Morris printed fabric in shades of lavender, pink, and green. Then, if I get all these projects completed, there's always these to start. I love Colette patterns, but am pretty scared to try my own, even after seeing all the cool ones people have created online. But, practice makes perfect, right? 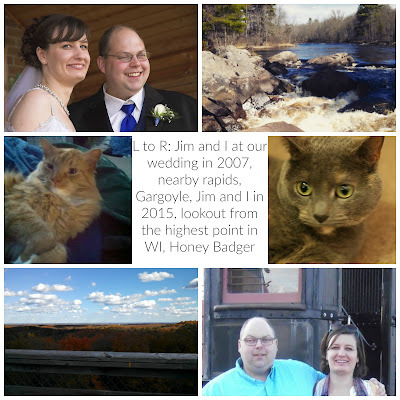 So, once I finish up some of my works in progress, I really want to take a stab at one of these.